When you give a synthesizer a name rather than a number, it suddenly gains an intangible yet undeniable aura. If I think of Jupiters, Prophets, Wavestations and Viruses, I mentally group them together as a family — and with this association, inevitably, comes a degree of expectation. 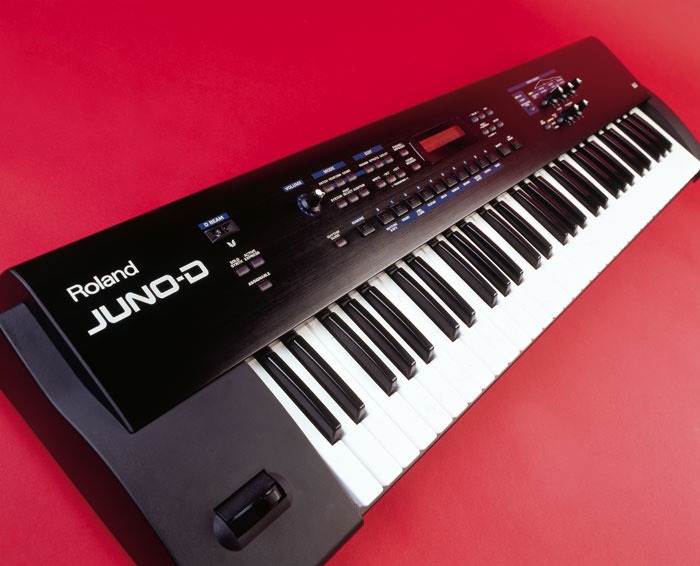 As the venerable Roland Juno range of synths holds a special place in my affections, I was interested to hear of a fresh addition to the fold — the Juno-D. Could this be a 'Juno-Digital', perhaps employing analogue modelling techniques? Or are Roland engaged in what I'll kindly call a 'marketing exercise'? Let's cut to the chase: other than its name, the Juno-D has nothing in common with either the Juno or the Alpha Juno synths. Instead it has its roots in Roland's PCM-based range. This synth sounds like an RS and looks like an RS (see review of original RS9 in SOS May 2001 issue). Thus its slimline black panel is shy and somewhat anonymous, with real-time tweaking courtesy of just five knobs to control envelope and filter settings, plus modulation and tone balance. Performance controls include Roland's combined pitch bender and modulation lever, a D-Beam and two optional pedal inputs. The 61-note keyboard feels quite positive but is let down by its lack of aftertouch. I find it sad that, at the budget end of things, it's always this particular avenue for expression that goes first. Externally, there are no further significant revelations, but you won't be surprised to find that the synth has stereo outputs, a headphone socket, a warty 9V power supply and MIDI in and Out sockets (sadly, no Thru). At just 5kg, it's easily one of the lightest keyboards I've ever carried into my studio. The Juno-D is a General MIDI 2 (GM2) compliant synth, so prepare to audition oodles of sounds, ranging from orchestral and ethnic instruments to dance basses and percussion, with an ample assortment of pianos, guitars, choirs and so on. There's even a decent mellotron flute (although the mellotron strings are rather lifeless) and the organs and pianos — especially the electric pianos — are all good enough for an aspiring band on a budget. There's a lot on offer, and I swear I came across Enya at one point, fulfilling an ambition of many years. And where would we be without squelchy 303-type basses, guaranteed to have you reaching for the filter cutoff and resonance knobs? While these particular sounds aren't the Juno-D's greatest strength, with a little overdrive and some gratuitous knob wiggling, they should prove good enough for live. In total, there are 768 Patch locations (128 user-programmable), plus 22 Rhythm sets and 40 Performance memories. Of the preset patches, 384 are described as "Juno-D original" and 256 conform to the GM2 spec. With its maximum of 64 notes, Roland can't be accused of starving the Juno-D of polyphony. It wasn't so long ago that this figure was considered ground-breaking and it's an important factor in extracting the maximum mileage from this slender keyboard. The simple rear panel, which includes stereo outs, headphone socket, external PSU input and MIDI In and Out. Each Patch consists of one or two 'Tones' — essentially Rolandspeak for complete PCM instrument samples — and if two are used they can be layered or split into separate keyboard zones. Editing of either Tone (or both simultaneously) is directly with the knobs (although several additional options are available at the push of the 'Param' button). Thus, turning knobs alters envelope attack, decay and release (the sustain level is fixed), varies filter cutoff and resonance, or sets the depth (and speed) of pitch or filter modulation. Other than add effects, there's not a great deal else you can do, so it's fortunate that 640 Tones are provided (in 32Mb of memory) as starting points. Once you've made some edits, the Write button is on hand to store your creation in any of the 128 (initially empty) Patch locations. The Juno-D arranges its sounds into categories, 38 in all, grouped logically together beneath 10 top-level Category buttons. So, for a piano sound, select 'Piano' and then you can choose from a range of acoustic or electric pianos. Select 'Guitar' and you'll be presented with a selection of acoustic, electric or distorted guitars. It couldn't really be much simpler. After naming a Patch of your own, you assign it to a category so that it appears in the list of your choice. Usefully, the Juno-D remembers the last sound you selected in each category. To select only your original sound creations, use Shift and the right arrow key to jump through the categories one at a time. The User Patches are found after the final one, 'Bass'. Should you need it, an Audition button is provided to play an appropriate riff for each patch you select. There's also a dedicated 'Demo' button, just to be sure you can impress your friends within seconds of switching on. Not everything is so simplistic, though. Tucked away in the System menu is the slightly exotic 'scale selection', featuring well-tempered, pure major, pure minor (both C-scale) and Arabic. Unusually, each note in the scale is user-tweakable in 1/100th semitone steps. The Transpose function offers a little extra, too: if you use Shift and Transpose, transposition is in semitones, which is ideal for playing in difficult or unfamiliar keys. The Juno-D is blessed with a flexible arpeggiator. Within each Patch category there's a selection of arpeggio templates appropriate to that style. When the arpeggiator is active, styles are selected using buttons 0-9, with zero referring to any user template you may have created. Although the arpeggiator is not fully programmable, the manual lists 82 different styles, each with a number of variations (adding up to 473 styles in total — I'm quoting the manual here, I didn't count them!) and nine arpeggio templates for each of the 38 Patch categories. There are also eight user templates. You can decide whether a Patch's upper Tone, lower Tone or both are triggered by the arpeggiator. In a Performance, you can also select from 32 preset rhythms to play along to. These trigger the currently-selected drum kit and serve as a basic built-in drum machine. Tempo is set either by the Tap Tempo button or by using the value keys, having first pressed the Tap Tempo button. To make life even easier, a Multichord memory function is provided, that allows you to play a chord by touching a single key. You can assign every note in an octave to play a different chord, and then save them as a set. To do this, press the Chord Memory button and hit a key on the keyboard. This shows how many notes are currently stored for that key. Press the right (Page/Cursor) key and a 'Record' screen appears in the display. Now play a chord of up to eight notes and any previously saved chord is overwritten. When you've programmed chords for each key, press the Write key to store up to eight user chord sets. Naturally, an assortment of chord sets have already been stored at the factory. There are 16 of these in total, ranging from pop and jazz to octave or fifth-interval stacks. Up to 16 Patches can be played simultaneously in a multitimbral Performance — of which there are 40 in total, 32 of them preset. Having just eight user Performances is definitely on the stingy side, since these offer a means of creating far more extravagant layers than is possible in a single Patch. I guess I've never really understood why you would need more than one preset Performance (just to guarantee accurate playback of General MIDI files). You can edit Patches from within a Performance, although you should remember that if you edit a Patch referenced by a different Performance, the changes will affect that one too. Usefully, you can create a unique effects setup for the entire Performance or hijack the effects settings already used by any of the 16 Parts of it. Each Part has its own send level for reverb and delay, plus an on/off status for the multi-effects processor. When you're in Performance mode, Parts can be quickly selected using the 10 Category buttons. Just activate 'Part Select'. Parts 11-16 are selected using shift and the appropriate button. There are 22 Rhythm Sets (drum kits to you and me), with two of those being user-editable. Editing is restricted to altering each drum's tuning, plus its level and pan, chorus and reverb send. You can't change the PCM samples allocated to each note, so you do need to select a factory kit that's as close to your requirements as possible. Filter settings affect the whole kit, offering you a cool opportunity to sweep the entire rhythm section with the cutoff knob. A feature I particularly like — and one that's missing from many modern multitimbral synths — is Voice Reserve, invaluable when you're gigging with just one keyboard, where perhaps your sequencer is playing several parts and you're playing others manually. Voice Reserve is a tool to prevent note stealing for key parts, so you won't inadvertently play a large chord and silence the bass or drums! Even with 64 notes of polyphony, this can happen (I speak from personal experience), so Roland are to be applauded for including it. D-Beam controllers add a welcome extra dimension to performance, and the Juno-D's has three selectable functions: Solo Synth, Active Express and Assignable. The first of these, Solo Synth, is curious in that it works in combination with keys held on the keyboard. An example should make things clearer. Activate Solo Synth and play some keys — a simple C-Major triad, perhaps; you'll hear nothing. Now move your hand vertically over the D-Beam and the held notes are triggered at the speed of your hand movements. The notes are transposed in octaves within the working range of the beam and I initially found this rather difficult to control. Fortunately, the beam can be adjusted to give a narrower range, although the sensitivity is global for all Patches. With practice, I was able to achieve a wide variety of effects, such as eerie theremin, elaborate harp strums and piano arpeggios so fast I could never play them manually. I occasionally generated a note inconsistent with the chord I was holding, but found if I moved my hand with reasonable precision, the D-Beam coped fine. Next, I tried the Active Express setting, transforming the D-Beam into a volume control (or a balance control, if two Tones are used). The main problem with this mode became immediately obvious: as soon as I removed my hand from the beam, the volume dropped to zero. Fortunately, another global option is available to reverse the beam's polarity. When you make this change, moving your hand downwards makes the sound quieter, while taking it away restores the maximum level. I didn't actually find Active Express to be of great value, so I turned quickly to the Assignable button, which allows the D-Beam to control a wide array of parameters, such as duplicating the front-panel knob functionality or sending pitch-bend or aftertouch. You can also control effect sends and some of the parameters of the multi-effects. My only complaint is that the beam affects the entire range of whatever is chosen. So, for example, if you assign it to control filter cutoff and then take your hand away, the cutoff setting plummets to zero — as I've just explained in relation to Active Express mode. Again, reversing the beam's effect is a partial solution, but I then found I could freeze the D-Beam's level at any point by pushing the Assign button with the heel of my hand while setting the level with my fingers. It's fiddly, but it works. The D-Beam is a feature that rewards the time you spend with it, although I get the feeling that if just a little more thought had gone into its implementation it would be a killer feature rather than simply a fun diversion. For an instrument in this price range, the Juno-D's effects are impressive, offering three effects processors: reverb, chorus and multi-effects. Of these, there are eight reverbs (also including some delays) and eight chorus types (including flangers and short delays). Add to this no fewer than 47 multi-effect types — some of which are dual effects (for example, an overdrive and chorus in series) — and you have a comprehensive range of treatments at your fingertips. When you program dual-Tone Patches, you can select whether each Tone is to be processed by the multi-effect processor, and you can set individual send levels for reverb and chorus. Within the multi-effects are pitch shifters, equalisers, rotary speaker simulations, phasers and distortion, as well as less commonly-encountered effects such as Slicer and Feedback Ripper (the latter being a kind of gated delay). In fact, the delays are particularly good, especially the quirky ones such as 'Tumbling Delay' with its fast initial repeat followed by a standard delay, and 'Time Control Delay', which is designed for real-time control, changing from one delay time to another with accompanying, rather off-the-wall, pitch shifts. Over 20 years ago I got my first 'proper' polysynth. It just happened to be a Juno — a Juno 6 — and it still evokes fond memories today. The Juno-D doesn't have such a distinctive personality and it's hard to imagine that it will gain a comparable historical significance. But set aside the name (as Roland should have done) and what you're left with is a solid all-rounder whose synthesis is about as uncomplicated as anything you'll encounter. This makes it ideal for beginners or those in need of a no-nonsense array of solid bread-and-butter sounds that involves them in the minimum of head-scratching and manual-searching. For young bands or club entertainers, the Juno-D is a pretty good bet. A light and portable workhorse, it has generous polyphony, a first-rate effects implementation, a versatile arpeggiator and a D-Beam to pose with. It should certainly earn its keep amongst gigging musicians on a budget. Supplied with the Juno-D is a CD-ROM containing editor and librarian programs for PC and Mac. I installed both programs on my PC and found them to work as expected — although the Juno-D isn't exactly complicated to program in the first place! However, the software is perfect for speedy creation of user Performances, and storing these on a computer is handy, given that only eight can be saved in the synth. Only eight user Performances (multitimbral setups). The Juno-D provides a wide variety of sounds and simplified controls, plus the kind of polyphony levels we once drooled over. The 'Juno' name gets us off on the wrong foot, but if you ignore that, this is a splendid, low-cost addition to the RS range of keyboards. Roland UK Brochure line +44 (0)1792 515020.